At any rate, I just finished reading The Silver Chair for what is, I think, the third time. This title, along with The Horse and His Boy, have been my least favorite of the series. (My favorite being The Lion, the Witch and the Wardrobe with Voyage of the Dawn Treader taking a close second!) Whenever I think of The Silver Chair I always think of Amy because her favorite character is Puddleglum. But even if there is a title in this series which is less of a favorite, I'm still able to learn from it and enjoy it. In fact, I learned to appreciate this one just a little bit more after spending time with it again. Just like a friend, sometimes books take awhile to get to know and respect. I respect The Silver Chair more after this particular re-read. "How did you get there?" said Jill. She had also felt curiously shy. "The only way you can - by Magic," said Eustice almost in a whisper. "I was with two cousins of mine. We were just - whisked away. They'd been there before." Now that they were talking in whispers Jill somehow felt it easier to believe. It's amazing how many things - both good and bad - can be said in a whisper or "behind closed doors" and be believed. If we make accusations in secret, they are readily accepted as truth. Therefore shouldn't we be careful about the words we use when speaking of others in back rooms, crowded church sanctuaries or private e-mails? Words spoken in secret hold a great deal of power, regardless of what we might like to think about them. "Oh come on! Bother the Signs," said Pole. "Something about someone mentioning Aslan's name I think but I'm jolly well not going to give a recitation here." Oh, bother talking about this passage! I don't really want to. Because I'm the chief of sinners when it comes to forgetting scriptures and not remembering what the Word of God says when it comes down to being practically applied to my life or anyone else's. Sadly, I can relate to Jill being annoyed by being pressed for a recitation of the signs which Aslan told her to remember and obey. (And how many times have I said, "Well, I know that the Bible says _____, but I just can't remember WHERE." Isn't it important to know where? You might feel like telling me that references aren't so very important because maybe you don't take the time to memorize scripture and references also. But I think that's a cop-out and an area where I am remarkably lazy and must improve in. There's no value in sugar coating it. I need to "remember the signs" myself. Then the pale lantern was hung up amid-ships, the Earthmen sat to the oars, and the ship began to move. The lantern cast its light only a very short way. Looking ahead, they could see nothing but smooth, dark water, fading into absolute blackness. "Oh whatever will become of us?" said Jill despairingly. This was the paragraph which made me really, really like Puddleglum, the Marsh-wiggle. He's kind of a "down in the mouth" sort of character. He seems to always be looking for the worst in things and you feel the need to come along side and cheer him up. But when push comes to shove and there's a job to be done, he's your man, er, Marsh-wiggle! You want him around when you are in a tough spot because he doesn't enter into the fray in a despairing way. In the roughest moments in this story, when things look bleak, Puddleglum speaks and acts in a way that says, "No matter the cost, I will follow Aslan." In fact, one of the main themes of The Silver Chair is persistence in the faith. Prince Rilian makes the remark at one point that whether they all live or whether they die, they are Aslan's. And that is exactly how we are to face life as Christians. God doesn't tell us whether or not the path He plans for us to walk is going to be easy or hard. (It's likely to be easy in some spots and hard in others!) He merely requires that we believe Him and obey Him. Whether we live or die, we are Christ's. We may not squeeze through on some adventures. I think of my dad and my mother-in-law who both died of cancer. In their trials they never once denied Christ or indicated a lack of faith. They were (and are!) the Lord's. I think of my brother-in-law who died in a car accident. He didn't make it out of that adventure but He was never outside of God's sovereignty. He followed Christ and we are thoroughly satisfied that we will see him again one day. For the moment, Jonathan and I walk this path called life. Whether we live or die, whether we are well or sick, whether we are wealthy or poor, whether we have friends or are lonely - we are the Lord's! We do not expect an easy ride. We merely pray for faith, grace and strength to press on until our individual races are completed. "Courage, friends," came Prince Rillian's voice. "Whether we live or die, Aslan will be our good Lord." I agree this wasn't one of my favorites in the series, but it's still a favorite of books in general and has some great life lessons and adventures. I like how Lewis always make the children so realistic, with arguing and getting on each other's nerves (but not in an extreme bratty way like in books today), yet bringing them to a realization of their wrongs. 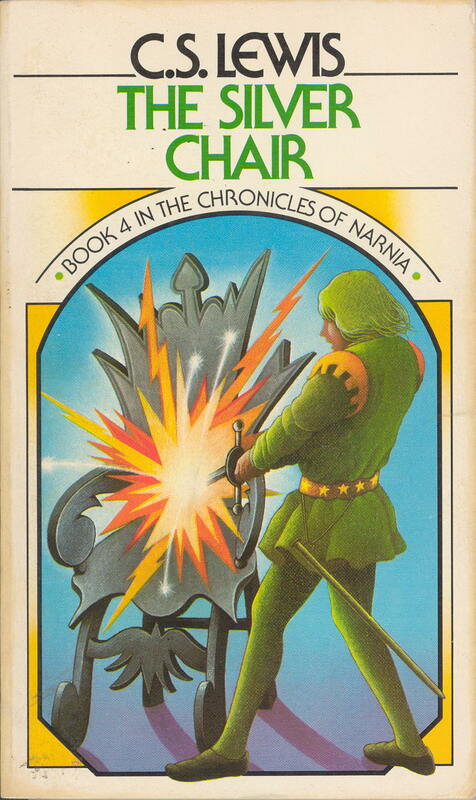 I rather liked The Silver Chair, if for no other reason than Puddleglum himself. I think it also gains some interest for its parallels with Dante's Inferno - which Lewis intentionally creates. Carrie might appreciate that, in my mind, Puddleglum always looks a bit like my brother. 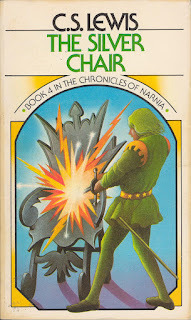 For pretty much exactly the reasons you listed The Silver Chair has been one of my favorites. That and Puddleglum. Oh man, do I love Puddleglum! I like that you were a firm believer in a specific reading order and then you forgot it. I have always read The Magician's Nephew last, but only because I had the same cover art you have there. I don't have a very solid opinion. I could see how reading TMN first would be helpful. Okay, I just read your review finally after writing up my (admittedly very brief and general) review for RAT tomorrow. I can't believe this one is one of your least favorites!! Oh, the horrors! :-) I think it's funny that some people don't like it all but others LOVE it.